The Story of an Unsung Hero.. .
Devaram Gujjar is a 47 year old resident of Kala-khora Village. He is a strong headed, tough and well built man. Although he is an ordinary villager, he does an extra ordinary task... The conservation of forest around his village. This he has been doing committedly and courageously since the past 16 years, in spite of all the foot-dragging and antipathy from fellow villagers. Those tourists visiting Ranthambhore regularly must be acquainted with the mountains behind Amli Dha... This 2 Kilometer long strip from Kala-khora to Ghadin is saved due to the efforts of this one sole man. Not just protecting this patch Devaram has also been actively planting trees in his area. He has planted 200 Neem trees around his village. 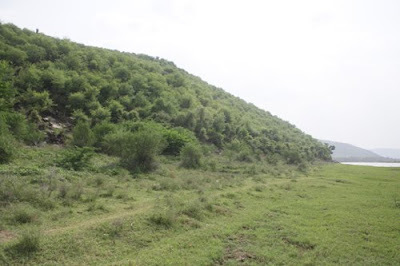 The Patch of land protected by Devaram since the past 16 years.. However now he is facing severe opposition from his fellow villagers. Although his is a small village comprising of 15 houses but in mid July 80 people; who were summoned from neighbouring villages Talada, Bajoli and Gadhin (under which the green patch falls) charged on Devaram. 1) This patch of forest connects Ranthambhore National Park with Keladevi sanctuary; Keladevi sanctuary is just 1 kilometre away from this belt. Thus it is a very important corridor acreage. 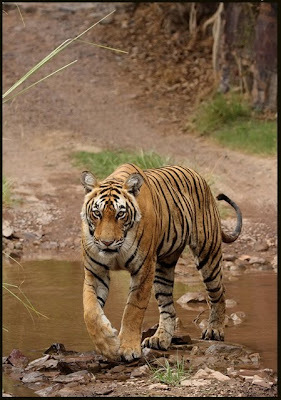 Serves as an important connectivity between keladevi and Ranthambhore National Park for the tigers.. .
2) In the periphery of Ranthambhore there are just 3 areas which are covered with rich indigenous trees species. First is the belt adjoining Ranthambhore Bagh hotel to Jhumar Bawari up to the main gate of Ranthambhore National Park. The reason why it is saved is because all tourism hotels fall in this area, the Forest Department and tourist vehicles pass this patch and due to this vigilance the protection wall is not broken by the villagers. 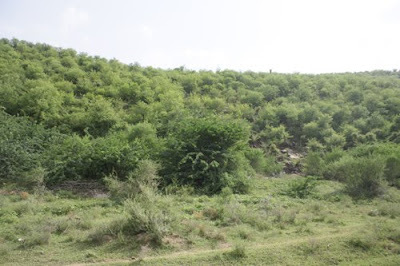 The second area is near Sher bagh and Khem Villas Resorts, a small hill, saved by the efforts of Dr Govardhan Singh Rathore. The third area is the one protected by Devaram, it has NO protection walls, the areas nearby have heavy cattle grazing activities. 3) Till now the efforts seen were from the government, NGO’s, tourism personnel as a bounden duty, but this is the sole representation in Ranthambhore’s muse of history that an individual has worked for conservation without having any personal motives. Whoever has cut the 15 odd trees in this 20 days should be prosecuted and strict action should be taken against them otherwise this will be an open invitation to the rest of the villagers! Thank you Divya for this amazing information. We get so caught up in our own efforts that we neglect what the villagers are doing at their level to protect the forests. Devaram deserves not only accolades but recognition too. He will get "teeth" if he is made an 'Honarary Warden' and get the clout of Forest ADepartment behind him. 'Amli Deh' was well protected till a short while age when an independent small time operator was running a 'Birding Safari' place. The Shack he operated from was perfect and did not detract from the landscape. Now I believe this place has been 'auctioned' by the authorities and the present 'operators' have no interest in conservation and no interaction with locals. Tell Jogi to keep telling his stories, we love him. 2)mall patches of forests in a corridor belt are crucial as stepping stones. All the best...........A.J.T.Johnsingh. 3)He should be proposed for wildlife awards. 4).Amazing guy….What can we do? This man is very courageous indeed. He is an example of how one person can help save the tiger, even if it is in just one section. With at least one tiger or more fallen by poachers, revenge killings, and other causes, we need more people like him. 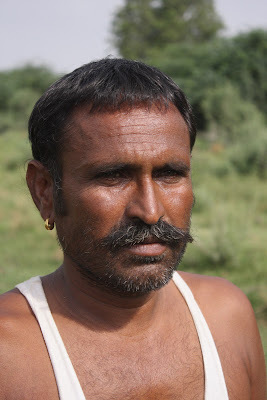 Rajasthan, but Devaram Gujjar has been fighting a lone battle to protect the forest cover over a four sq km area between Keladevi and Ranthambore National Park for the last 16 years. This canopy of green, with indigenous trees species, is however under threat, ironically from the village Panchayat itself. But for just 200 Neem trees that Devaram has planted over the last so many years, all that he has been doing is, to protect the green area around his village. Hailing from a tiny hamlet Kala-Khora, that does not even have an electrical connection, the 47-year-old strongly built gujjar has for years resisted the villager's feud to let them cut trees for fire-wood and to let their cattle graze. The hills nearby have heavy cattle grazing activities and owing to lack of rain, can't get enough fodder for the cattle or fire-wood. Then recently, the Gujjar Samaj Panchayat of his village issued an order that, "If Devaram tried to stop any fellow villager from entering the woods, he would be fined an amount of Rs 51,000." And soon after this order was passed, in the last 20 days, about 15 full grown trees have already been cut by the villagers. "This is a tiny village of just about 15-20 houses and we learned of Devaram's efforts only when we took officials from the Tata Energy on a trip to this village to evaluate if we could provide the villagers with solar light. Amazingly, while Devaram has been doing this for years, there is no fencing, no sign board and absolutely no fuss about the results of his effort," said Dharmendra Khandal conservation biologist working with Tiger Watch, Ranthambore. According to Khandal, "Mid July, about 80 villagers gathered in Kala-Khora from the neighbouring villages of Talada, Bajoli and Gadhin, which fall under the green patch from Kala-Khora to Ghadin created by Devaraj, to confront him." "But with time and age it seems Devaraj is losing grip. His insecurity now is that if he resists, the Gujjar samaj would ostracise him from their community and he would have difficulty in getting his children married," said Khandal. Incidentally, this patch of green that he has protected is an important corridor acreage of forest that connects Ranthambore National Park with Keladevi sanctuary just a km away from this belt. While in his place any NGO or association would have gone about beating their trumpet, Devaraj simply wants to be left alone doing what he is doing. "I don't want any electricity, nor do I want any mention of my efforts or awards," said Devaram. Nevertheless, Tiger Watch plans to award him for his efforts with a cash award of Rs 5,000 and bestow Devaraj with the citation Hero of Ranthambore', said Khandal. For, if not given due attention, 16 years of selfless forest conservancy work will take just a few months to fade away. And to avoid that, Devraj's only request is to be able to pass on the baton to the forest guards, who can pitch their tents in this northern part of Ranthambore and protect the green cover.